A selection of sashimi was a joy to eat. 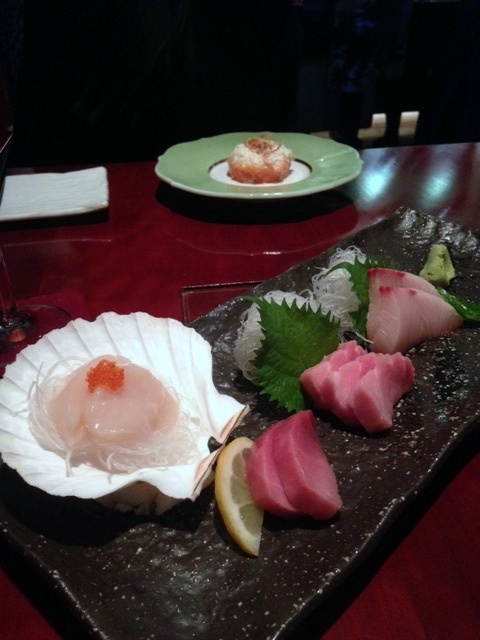 With two pieces a portion, we ordered the scallop, chu-toro (medium fatty tuna – £10.50), o-toro (tuna belly – £13), and hamachi (yellowtail – £9.50). 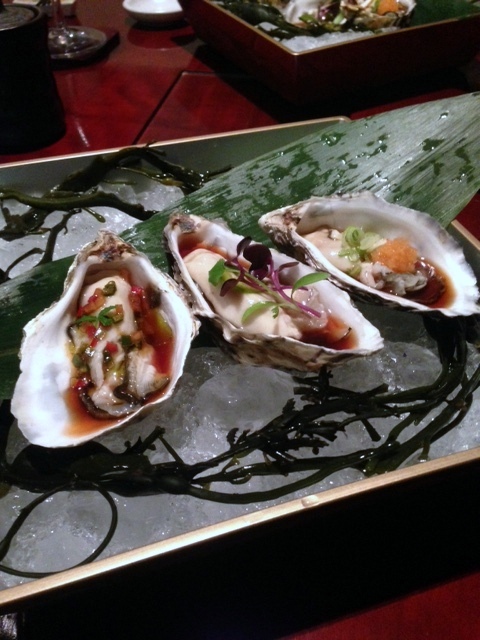 Each piece was resoundingly fresh and alive with flavour, with the o-toro being our favourite. Each piece had been meticulously sliced and was precisely presented. 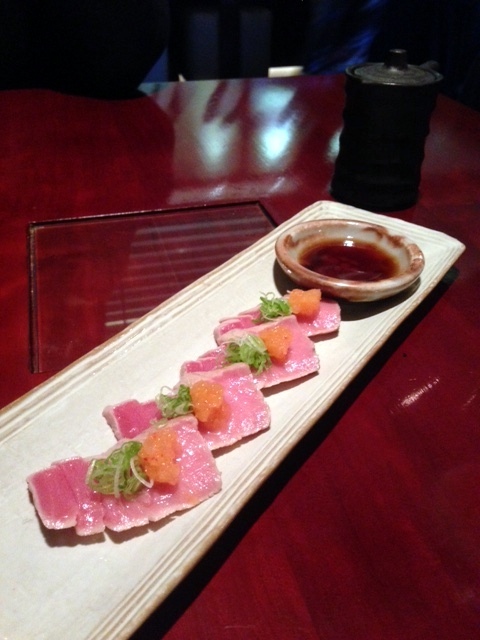 Chu-toro tataki, lightly seared, with jalapeno salsa (£15.50) was also glorious. Again the fish was the winning element. And the slight acidity and heat of the salsa worked wonderfully with the fish. We also enjoyed the seared butterfish (£12.50) which was silky smooth and lovely, and delicious with its accompaniments of coriander, radish, jalapeno with a soy citrus dressing. For something with a more eclectic twist, we tried the salmon tartar with ginger bud, red onion, parmesan cheese, yuzu, miso and crispy onion (£7.50). This was a true delight to eat. There was only a hint of parmesan in the tartare which gave the dish an unusual touch, yet it worked perfectly with the other elements of the dish. This was truly something worth experiencing. Also very tasty was the deep-fried spring roll with prawns, mushrooms and spring onion (£8.50). 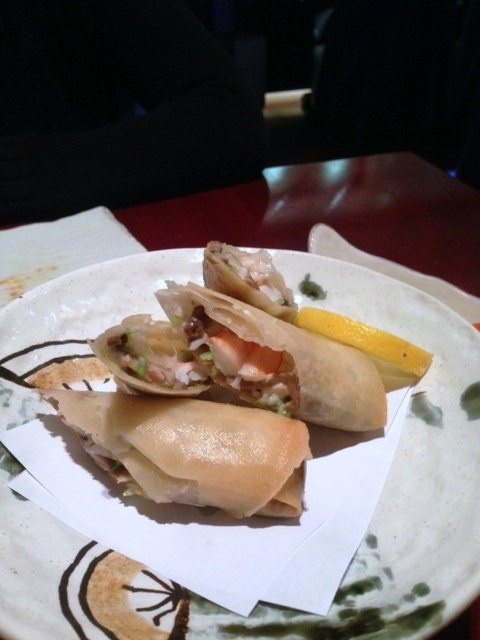 The spring rolls were lovely and crispy and very well executed. And the mixture of prawns with the mushrooms worked hand in hand. 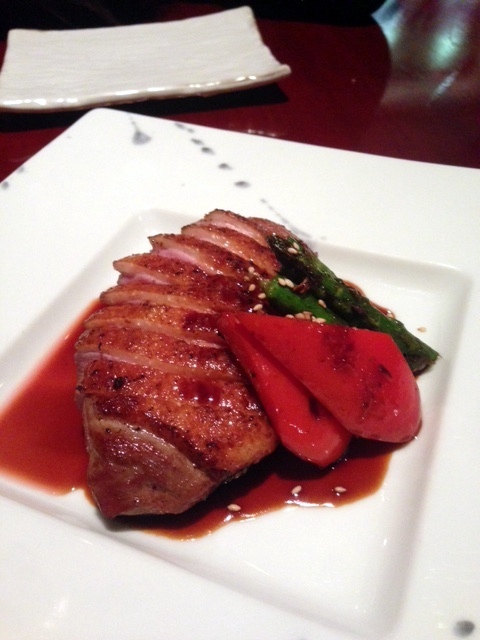 The weakest dish of the evening was the pan-fried duck with an orange teriyaki sauce (£15.50). The duck was well cooked to retain a pinkness. However the flavour of the duck itself was a little bland and it also had a slight chewiness to it. 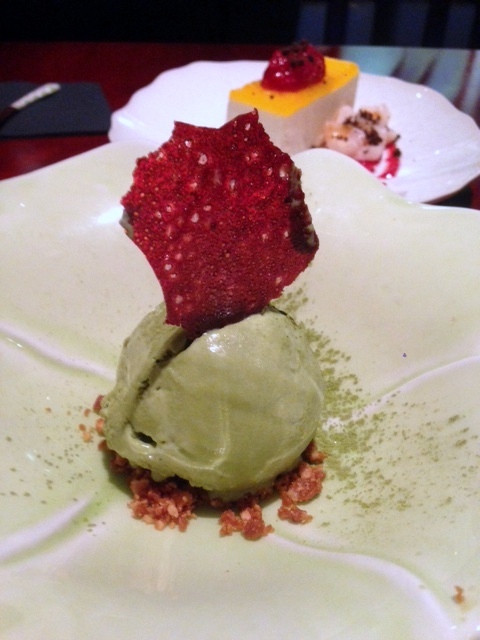 To desserts, and we particularly enjoyed the green tea ice cream with a raspberry tuile and peanut croquant (£6.50) as the ice cream had an rich tea flavour and was luxuriously smooth. 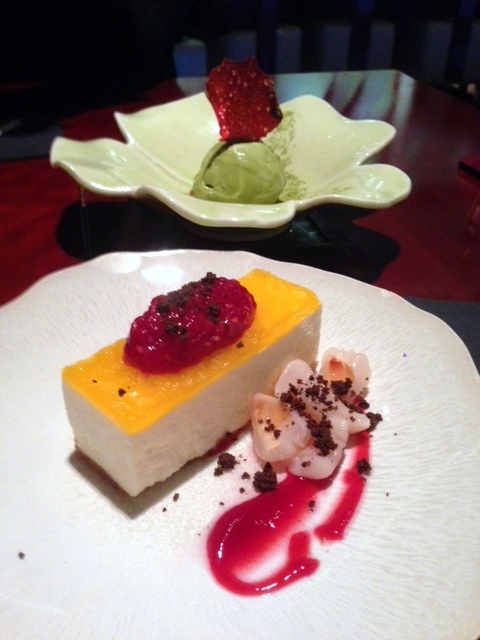 A vanilla cheesecake with yuzu glaze (£8.50) was also pleasant and satisfying. 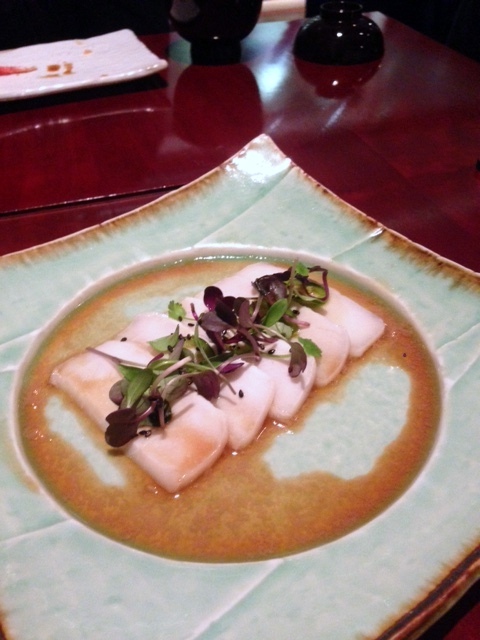 We had a wonderful experience at Tsukiji. The freshness and the quality of the seafood was outstanding and the creative, modern twists injected into the menu were certainly exciting. The venue is cosy and we were certainly made to feel at home by the lovely service. 1) The seafood was wonderfully fresh and delicious. with the o-toro being my favourite. 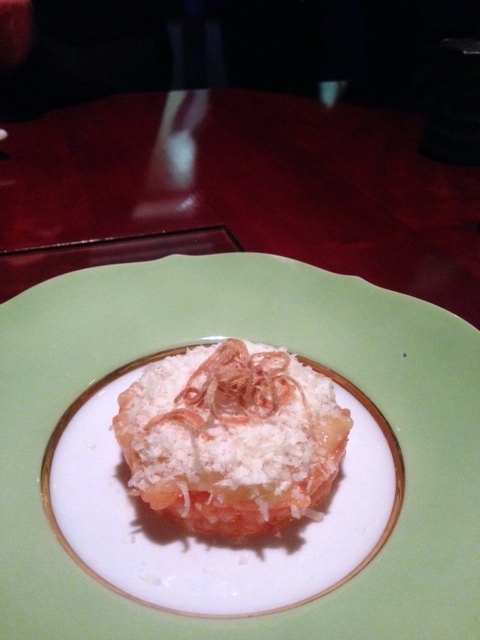 2) The salmon tartar with parmesan cheese was refreshingly different. 1) The duck teriyaki was a little underwhelming. Average Price: Average £50 a head.